It could significantly reduce the number of women needing invasive testing, which can cause miscarriage. In the UK, 750 babies are born with Down's syndrome each year. 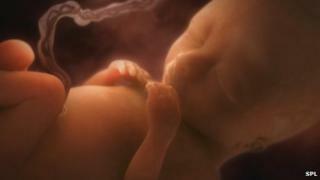 All pregnant women in the UK are offered screening for Down's syndrome. Currently a woman's risk is assessed, based on her age, an ultrasound scan and markers in the blood. Those deemed at high risk of a child with Down's are offered an invasive test. It involves using a needle to take a sample of either placental cells or of the fluid that bathes the baby - but this procedure carries a one-in-100 chance of miscarriage. The aim is to reduce the number of women having the invasive testing by more accurately assessing the risk. The new blood test, which is already available privately, looks for tiny fragments of DNA from the placenta and the foetus floating in the mother's bloodstream. Down's syndrome is caused by an extra copy of a massive stretch of DNA - a part or even all of chromosome 21. The test can analyse the free floating DNA for extra copies. It is thought to be 99% accurate. Those with a positive result will still be offered the invasive procedure to confirm the result. Prof Lyn Chitty, from Great Ormond Street who is leading the trial, told the BBC: "It could very significantly reduce the number of invasive tests and increase detection, this is seriously exciting stuff and it would be great to get it into the NHS. "What we are trying to do is give information on how and when to introduce it into the NHS." The NHS National Institute for Health Research funded trial will analyse the scale of the benefit and the best way to inform mothers and train staff, including midwives, about the test. "One of the very important aspects of our study is looking at ways to ensure women understand the test and the implications of the results so that they can choose whether or not to have it," she said. Dr Anne Mackie, from the UK National Screening Committee, said: "Early indications suggest that using Non-Invasive Prenatal Testing (NIPT) to screen women who are found to be at a higher risk of having a baby with Down's syndrome would enable earlier and safer detection of the condition. "[We have] been working in close collaboration with Great Ormond Street Hospital for Children, particularly in looking to ensure the new test does not affect the quality of the current service offered to pregnant women." Carol Boys, the chief executive of the Down's Syndrome Association said: "We would be delighted if tests which lead to miscarriage were discontinued. "We understand that the new test is approximately 99% accurate for those women who have already been established as having a high chance of carrying a baby with Down's syndrome, and are interested to see if that accuracy is maintained in women where this has not already been established. The studies for this are still under way." She said the information and education provided to women and health professionals would be important.